I had 9 hours to explore an iconic and important site of history during our day excursion in Athens, Greece. 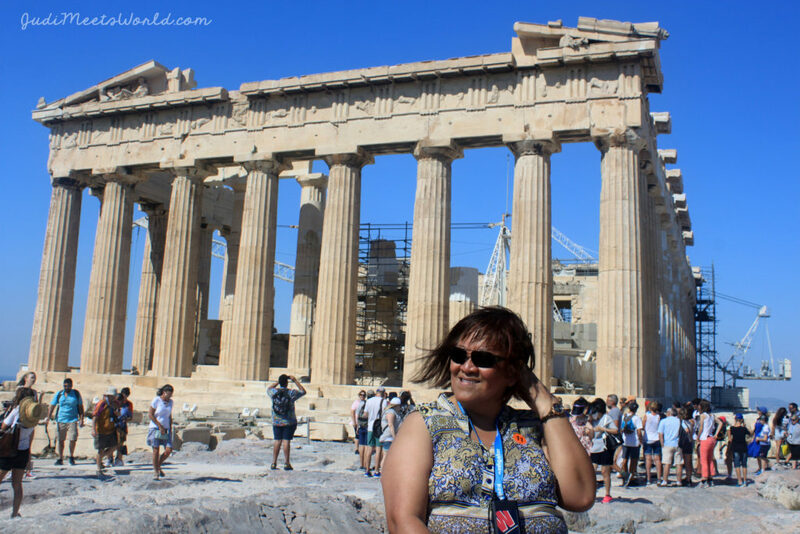 Read on to learn more about the sights of my visit to the Parthenon at the Acropolis! For those who don’t know me personally, I actually have an Honours degree in English and a minor in History. Greek history had been something I had literally studied and was a huge part of my learning growing up. I’ve also always been a fan of the goddess Athena. This visit to Athens was certainly an easy highlight of my European adventure. What I will say is that the Parthenon, sitting atop the Acropolis, is a symbol of Greek antiquity, in the city of Athens. “Acropolis” means upper city, and this was a place of refuge and safety when Athens was under attack. This is also why sacred buildings and places of worship were built on Acorpolis. Go early in the morning! I cannot stress this enough. While there are steps carved out in the stone, it gets hot, especially if the forecast doesn’t call for it to be overcast. Stay hydrated – it gets hot, you’re at a higher elevation so be aware and take care of your self. Ticket booths are at the base of Acropolis, by the main entrance. You can be a part of a guided tour (like we did) to help skip the line. The journey upwards to the Acropolis includes side sites to visit on the slopes. 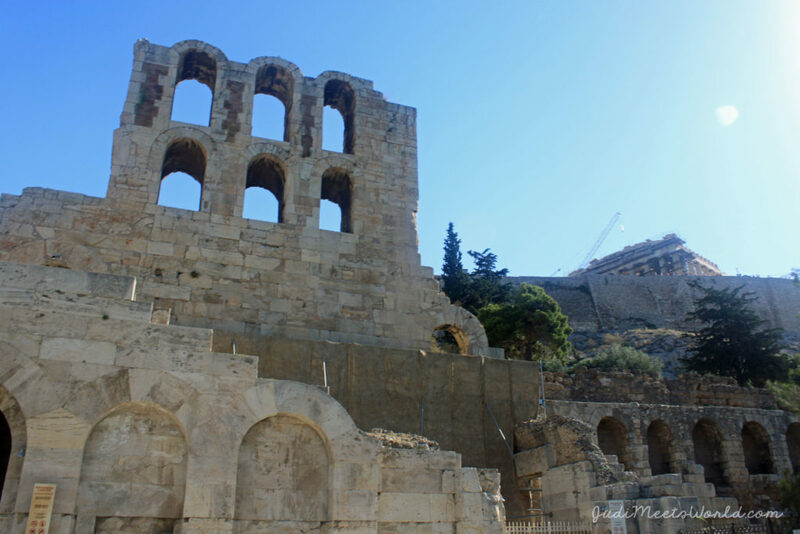 Here you’ll see the very well preserved Odeon of Herodes Atticus and the Theatre of Dionysus. The Odeon was built as an ampitheatre in AD 161, and was excavated in 1857-58. Restored in the 1950s, it continues to host live drama, music, and dance performances in the summer. This beautiful temple, on the north side of Acropolis, honours the legendary King Erechtheus. 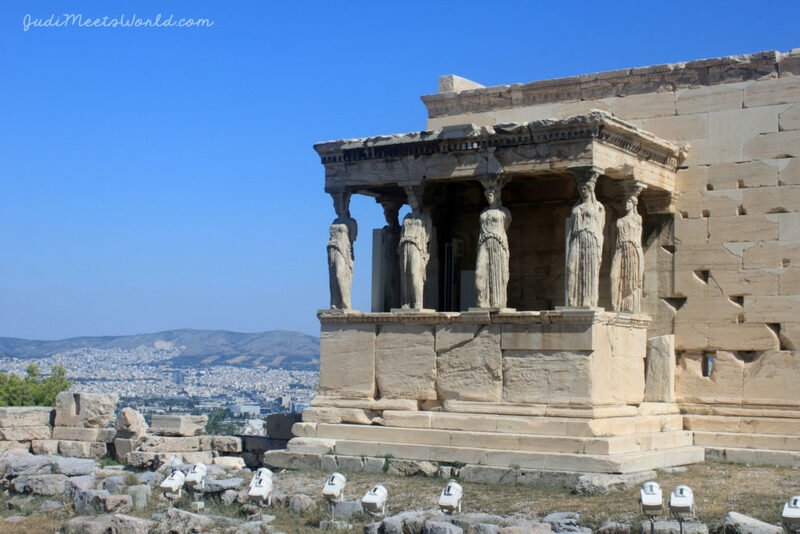 The beautiful Porch of the Caryatids have columns of six draped female figures, also called the “Porch of the Maidens.” There are also larger columns and porches on the north and south end of the temple. Where do I begin? I needed to take a good moment to pause and reflect that I was standing in a spot that I’ve read about and studied for more of my university degrees. 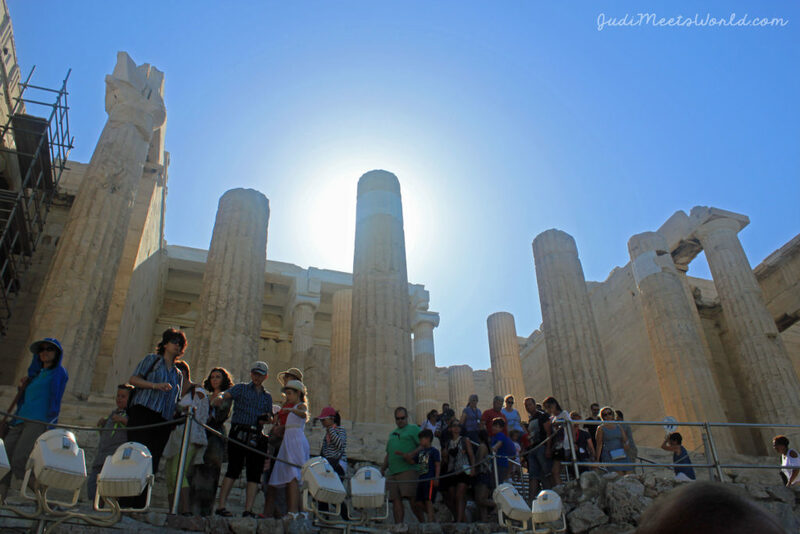 This beautiful, column-clad landmark was a temple dedicated to the patron of Athens, the Greek goddess Athena. 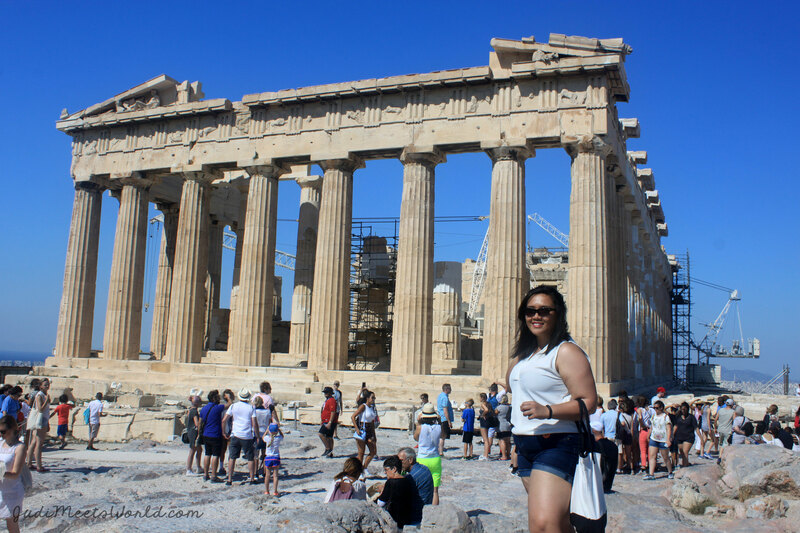 The Parthenon was created to house and protect a massive gold and ivory statue of Athena. It’s said that there are no straight lines in the Parthenon – there are a lot of opitcal illusions in the way the structure was built. Construction began in 447 BC, and needed about 30,000 tonnes of marble from a quarry 10 miles away. 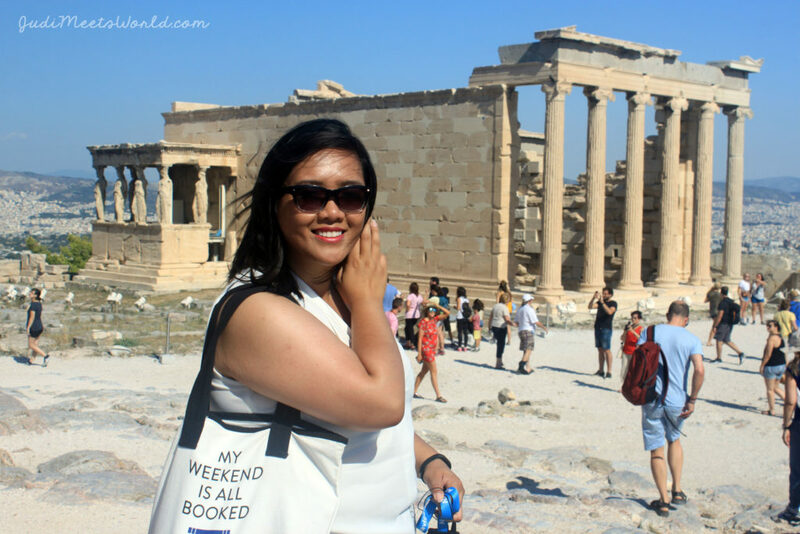 While you’re up here, enjoy the views of the modern day Athens below, and get up close to the marble carvings and ruins at the base of the Parthenon. 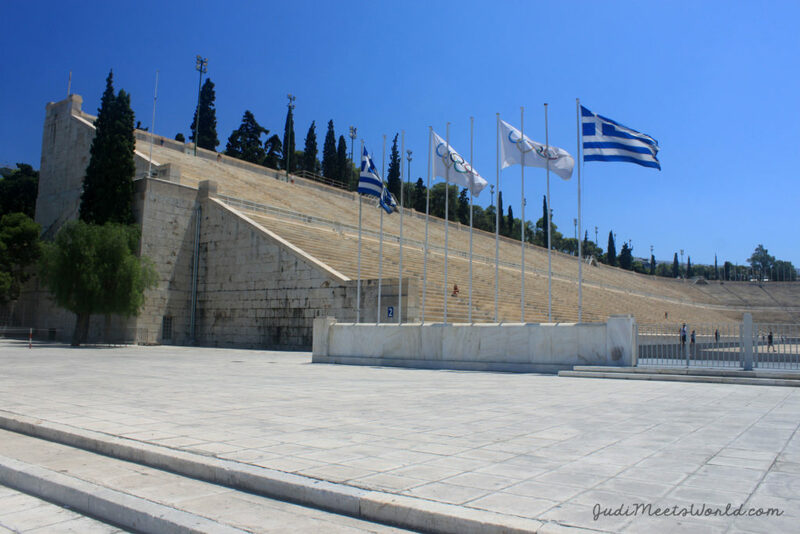 Athens hosted the very first international Olympics in 1896! The city was unamiously voted since Greece is the home to the ancient Olympic Games. 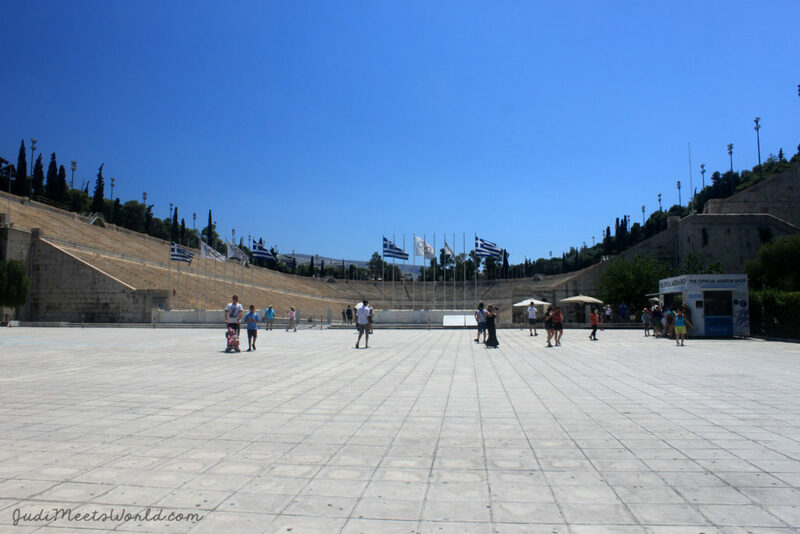 Built entirely out of marble, the Panathenaic stadium still stands today. In fact, it was actually a venue for the 2004 Olympics in Athens. The site also houses an official Olympic museum as well as a gift shop with Olympic gear. The Panathenaic Stadium is a short walk away from another landmark – the Arch of Hadrian, or Hadrian’s Gate. 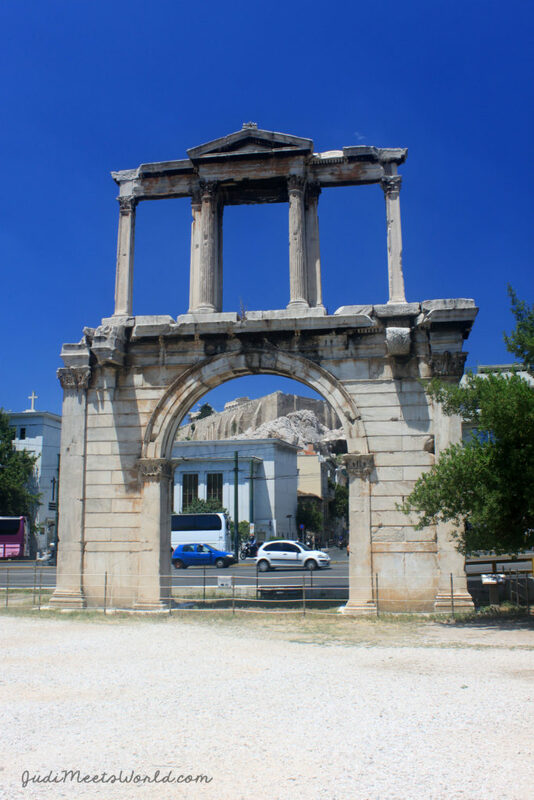 This Roman arch once straddled an ancient road in the middle of Athens. You can actually see the Acropolis in the distance through the arch of the gate. 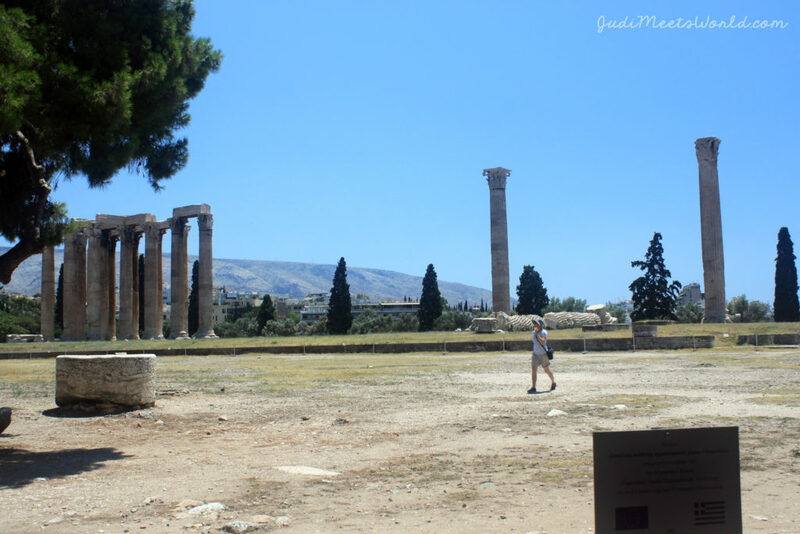 This road also led to the Temple of Olympian Zeus, which ruins can now be visited. Not too bad for having only 9 hours to explore Athens before returning to our ship. What was next on this adventure for us? None other than the (very windy) shores of the goregeous Mykonos. Stay tuned!